Art-books, Photo-books, Coffee-table-books, Story-books, paper types – What’s the difference? 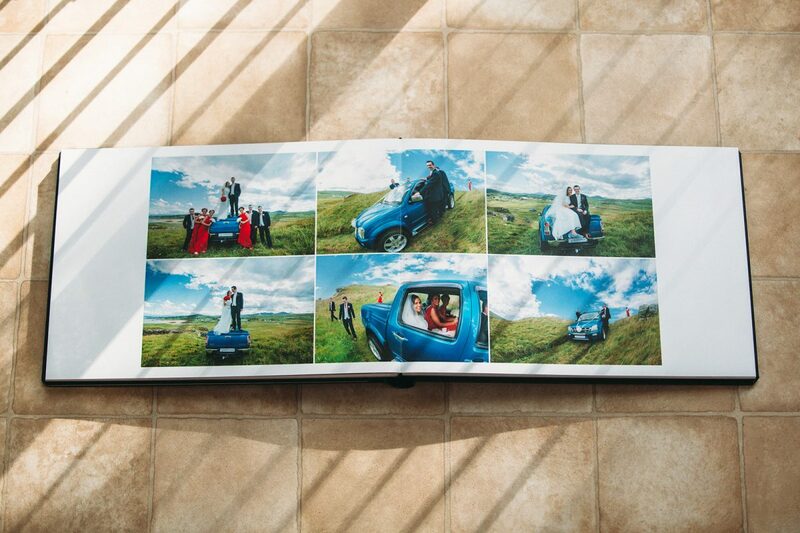 In 2016 we are spoiled for choice when it comes to having wedding books printed. There are many different terms that are used to describe these options as well as a glut of special names used by specific companies that can make things even more confusing. As a professional wedding photographer this can be a little frustrating as customers may be asking for one type of product but have entirely the wrong idea about what the product actually is and what these are most suited for. Personally I keep my range quite limited and use only two suppliers for albums and one other for non album prints. I know the advantages as well as the limitations of their offerings and I find that they fit my minimalistic design sense and my image tones. 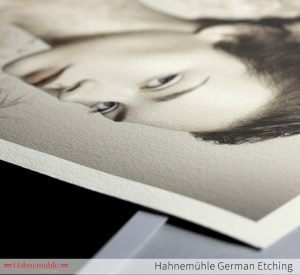 Art-books are lay flat albums constructed from photos digitally printed onto premium Fine-art papers and other materials such as Cotton Rag or Hahnemühle Rag. This printing method is referred to as Giclee in the art world but it is essentially a high end version of a ink-jet printing. 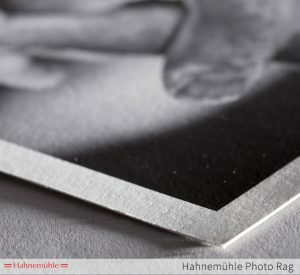 Matte-art and Cotton Rag papers are more expensive than standard photo papers. In general terms, Art-books should be handled like with care compared with standard photo-books but for some the Fine-Art look is worth the compromise. Your photos will look a bit less contrasty but the colours and tones will be deep and there are no reflections due to the papers being uncoated. All of my books come with lay-flat, rigid pages. All of my books tell the story of your wedding day so they all fit the description of a storybook. Getting a little more specific a Photo-book would usually be a book made up of photos developed on traditional photographic paper as opposed to fine-art papers (more on that later). In the professional photo world these types of prints are mostly known as C-types, though many are now digitally printed. The finish & texture will be similar to the prints that you would get at your local photolab but this will be mounted on a solid substrate or mid layer which creates a rigid page. Please note that I do not offer Glossy finishes. Photo-books are printed on Lustre paper (Fuji Crystal Archive) and are the best value option. Available in 8″x8″, 10″x10″ and 12″x12″ and up to 60 pages. These are generally cheaper books of the non lay-flat variety. I don’t offer these as they are available direct to customers from various online companies such as photobox. 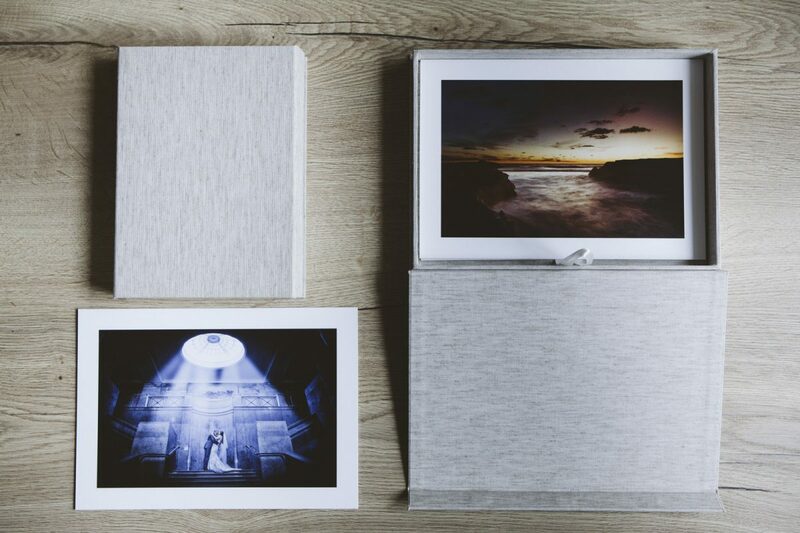 Print boxes are an alternative to albums and can be printed on both photo and fine-art papers. Clamshell box from QT Albums. Who makes my books and prints? Loxley Colour are used for smaller sized photo-print orders and can be purchased directly from your online gallery. The Print Space are used for large format photo-prints and Art-prints.